Takahashi FSQ-106ED @ f/5.0 (530 mm F.L.) Captured at 2.1 arcsec/pixel. Shown at 2.93 and 5.29 arcsec/pixel. 105 min. ( 7 x 15 min.) "
120 min. ( 8 x 15 min.) "
150 min. (10 x 15 min.) "
eXcalibrator v4.36 for (g:r) color balancing, using 156 stars from the SDSS-DR9 database. PixInsight for non-linear stretching with HistogramTransformation. NGC 6946 is located just 10 million light-years away, in the constellation of Cepheus. During the 20th century, at least six supernovae, the death explosions of massive stars, were discovered in NGC 6946. The most recent nova was 2004et. This high frequency of supernovae is the reason for the Fireworks Galaxy nickname. NGC 6939 is at a distance of about 4000 light years in the Orion Arm of the galaxy. This is a region of very rich molecular clouds. 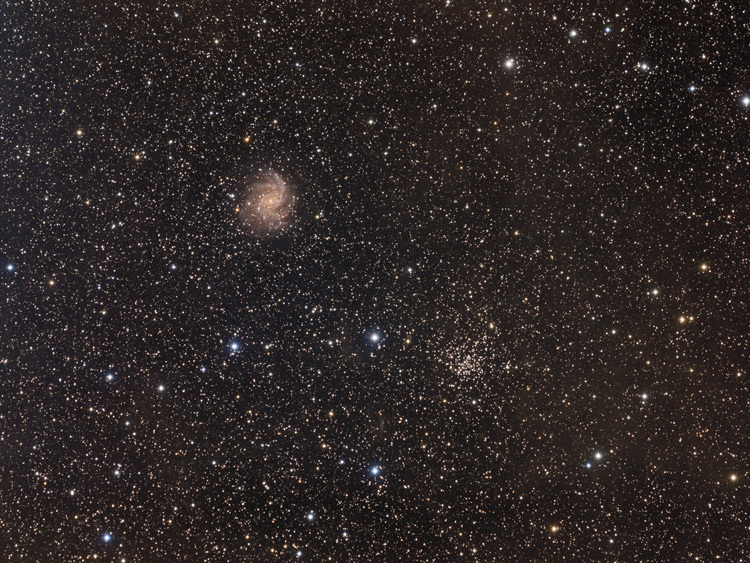 Because NGC 6946 and NGC 6939 are at a low galactic latitude, we view them through dust and various nebulae. This causes the light to become reddish, just as the Sun is red at sunset. This effect is called Galactic Extinction.